Hello to all Silicon Valley and San Jose Readers! Before anything, best wishes to all for a relaxing Memorial Day week end. Let us hope that next Monday will really bring out the sun and heat after a few unusually chilly days in Silicon Valley. A few days ago, I was reading an article on CNN about the fact that 31.4% of current borrowers (close to 16 million US home owners) were still underwater in the first quarter of 2012. This number, which has decreased from one year ago (32.4%) leads me to believe that, unless an economic miracle happens or a partial wipe-out of their debt occurs tomorrow, many families have dark days to live ahead of them. There is some good news to share though. The Obama Administration Housing Programs to help underwater families avoid short sales and foreclosure are still in place. Also, following the robot-signing scandal, lenders have reached out to distressed home owners and are carefully reviewing thousands of cases which could have been improperly processed. More recently, and as a direct consequence of the settlement, lenders have been asked to speed up their foreclosure review process (starting in June 2012) and will in my opinion be more inclined to approve short sales than let homes sell during auctions. All of this to say that short sales are likely to stay and continue to account for a substantial share of home sales in the coming years. In view of this, I thought I would share with you some of the most popular short sales terms used by real estate agents as well as lenders. 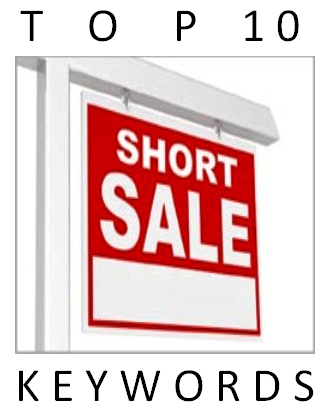 Not only these definitions should dispel a few myths and/or misinterpretations about short sales but also should enable you to be more comfortable when you hear your advisers talking about your own situation and available options to foreclosure. Servicer (aka Loan Servicer) designates the financial institution that collects your monthly mortgage payments and has responsibility for the management and accounting of your loan.